The amazing Ula has saved the day by writing this recap! After the showdown with Lilith, Jace and Sebastian are still missing. Clary decides to ask for faerie help since the Clave is giving up on finding the pair. The Seelie Queen agrees to help in exchange for a return of two telepathic rings. Clary, intent on returning them, looks for the rings in the library and finds Jace and Sebastian in the Institutes’s library taking some books. That night she finds them in the house, Jace pleading she comes with them. After they’re found, a fight breaks out and Luke is terribly wounded. Clary decides to go with Jace and use the rings to communicate with Simon. Clary leaves with Jace and Sebastian and learn that Sebastians wants to remake the Mortal Cup and create dark Shadowhunters with demon blood. Sebastian also knows about talks Clary had with Simon, who meanwhile tried to find a way to kill Sebastian without killing Jace. The solution is Simon summoning an angel and getting an angel blade while losing his Mark and its protection. When they all meet at The Seventh Sacred Site, a fight between light and dark Shadowhunters occurs and the light ones win. Sebastian flees and Clary stabs Jace believeing it will save him. He almost dies but is healed later, and now has a holy fire inside him and cannot be touched by anyone save Clary. Sebastian sends a message along with cut off angel wings to let everyone know he’s coming back. Two weeks after the death of Lilith and resurrection of Jonathan, Jace is still missing. The Clave has been questioning Clary using the Mortal Sword. Clary and the rest of the group ask the Seelie Queen for help when the Clave are about to drop the investigation after the search proves fruitless. The Queen is not easily persuaded and even throws an illusion on Alec after she is offended, but after her talk with Clary, she lift’s the illusion and agrees to help. In return she demands return of two Faerie rings which allow the wearers to communicate telepathically, to which Clary agrees. Later, when searching for the rings in the Institutes’s library, Clary sees Jace and Sebastian enter the room and catches them chatting like old friends before leaving with some books. Shocked, Clary runs to Simon, Izzy and Alec explaining what she saw. That night at Luke’s home, Clary wakes up to find Jace lying next to her. Jace tells her that he has returned to ask her to come with him. He also tells her he sensed her in the library and that he still loves her. They’re interrupted by Sebastian who Clary throws out of her room. She tries to reason with Jace while he tries to get her to leave with them. They are interrupted by Jocelyn’s screams as she discovers Sebastian in her home. A fight starts in which Luke wounded by Sebastian. As Jace and Sebastian disappear into nothing, Jace mouths to Clary that he will be back for her. Jocelyn decides that she and Clary should move into Magnus Bane’s house for their own safety and Magnus reluctantly agrees. After an argument with her mother, in which Jocelyn compares Jace to Valentine and says that Jace and Clary are not meant to be, Clary storms off into her room to be alone. While there, she Portals out to meet Simon at their diner. After some debating, Clary decides to join Jace, intent on spying on him and Sebastian, whilst using the faerie rings to communicate with Simon. Over time, Clary realizes that Jace is possessed and is acting much like Sebastian because of it. Meanwhile, everyone else is trying to think of a way to kill Sebastian without killing Jace since they’re tied together with Lilith’s magic. 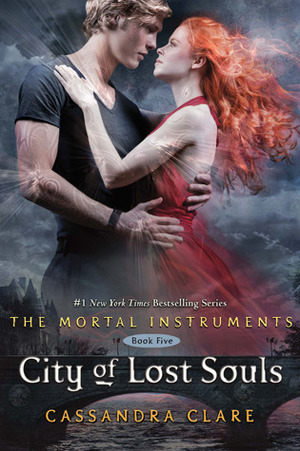 Izzy and Jocelyn go to the Iron Sisters for help and learn that the connection between Sebastian and Jace can be broken using a blade of Heaven, which can only be given by an angel. Simon suggests summoning Raziel. They agree that Simon should do this because he has the Mark of Cain which will protect him. Clary goes to live with Jace and Sebastian in a house Valentine bought for Jocelyn. Clary learns from Sebastian that he intends to make a second Mortal Cup with the power to kill all greater demons. Later, Jace manages to revert to his true self for a short time when the rune that is used to control him is temporarily damaged due to a fight he had earlier. Jace tells her that Sebastian wants to use Lilith’s blood to create an army of dark Shadowhunters. Later, Jace reveals he is going to turn himself in to the Clave for his crimes while under possession, believing it to be the right choice. Desperate for Jace not to risk his own life, Clary reluctantly calls out to Sebastian to stop Jace from leaving. Sebastian heals Jace’s damaged rune, repossessing him. Meanwhile, Simon and the others travel to Luke’s farmhouse to summon the angel Raziel. There, Raziel gives Simon a blade of Heaven, but in return demands to strip Simon of the Mark. Simon agrees and Raziel takes the Mark away, leaving Simon unprotected. Clary is searching Sebastian’s room when she finds her faerie ring and tells Simon Sebastian’s plan, and to come to The Seventh Sacred Site. Sebastian catches her when she is halfway through explaining, but she manages to get the important information across before she is forced to smash the ring. The Queen has been telling Sebastian about Clary’s and Simon’s talks because she knew Clary would keep the rings. Sebastian and Clary begin to fight, ending with Clary drawing an unfinished ‘Opening rune’ on the apartment’s wall. Clary and Sebastian travel to The Seventh Sacred Site to create an army of new Shadowhunters. Sebastian summons Lilith and mixes her blood in the second Mortal Cup, then demonstrates his creation by forcing Amatis – Luke’s sister – to drink from the Cup. Simon, Magnus, Alec, Isabelle and Shadowhunters from the Clave arrive soon after and Sebastian’s dark Shadowhunters meet them in battle. Clary then tells Sebastian that the rune she drew was a rune that destroyed the apartment the moment they left. Sebastian tries to force Clary to drink from the Infernal Cup but is saved. Simon gives Glorious to Clary, who tries to hunt down Sebastian. Unable to reach him, Clary uses the Angel blade and stabs Jace, believing that it won’t kill him as his heart is more good than evil. Jace starts to glow and collapses, leading the other to believe that he is dead. The battle ends when most of Sebastian’s dark Shadowhunters have been killed, and Sebastian flees. Clary sees that Jace is not dead after all, feeling a heart beat. He’s taken back to the Institute in order to heal. Alec confirms that it’s the real Jace because he can feel the parabatai connection again. After Clary finally talks with Jace a few days later, she learns that after being stabbed by Glorious, he now has holy fire inside him. That’s preventing people from touching him. Only Clary seems unaffected. Magnus breaks up with Alec because Alec considered Camille’s offer to take away Magnus’s immortality, even though Alec refused the offer in the end. After setting out to kill Camille for causing Magnus to break up with him, Alec discovers Maureen instead, revealing to him that she has killed Camille in order to gain leadership over her vampire clan by vampire law. Maryse shows two of the Silent Brothers a pair of angel wings, and a note from Jonathan Christopher Morgenstern with the word Erchomai, which means “I am coming”, which she found on the floor of the Institute library. Thank you so much for writing these recaps! I read a lot of series and I hate being confused when a new book comes out and it’s been a while since I read the last one! Ditto. I wanted to reread the series but I don’t have time so thanks for the recaps! Love this blog!